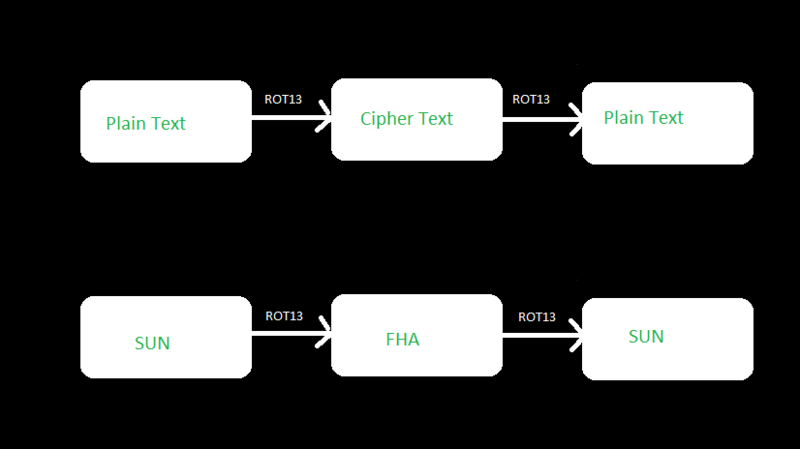 ROT13 is a letter substitution cipher and a special case of Caesar Cipher where each character in the plain text is shifted exactly 13 places. If you are not aware of Caesar Cipher then look at Caesar Cipher. For example the cipher for SUN becomes FHA. The encoder and Decoder for ROT13 is the same because there is no special logic during decoding since the shift for both encoding and decoding is the same. Below is the python code for the implementation of it. The code is pretty much the same as Caesar Cipher with the shift value set to 13 always. Any questions, comments or feedback are most welcome.